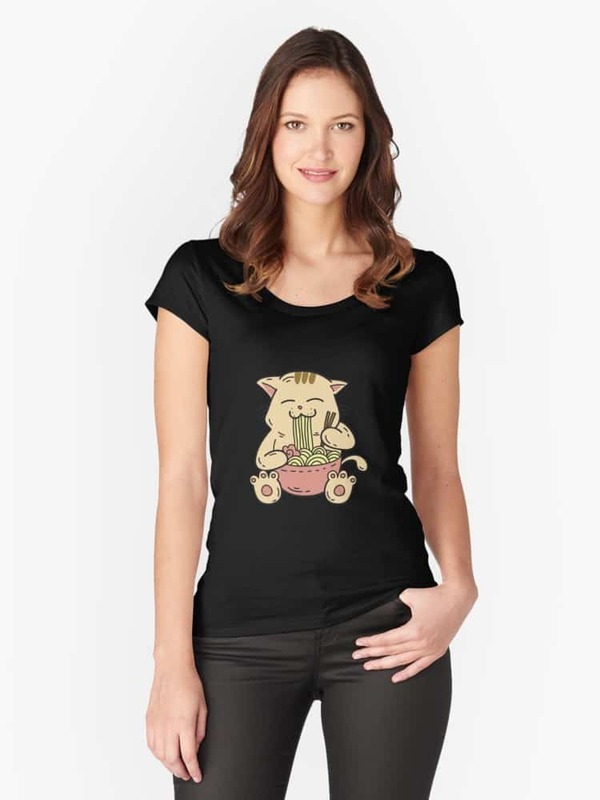 These anime cat shirts are a huge treat for anyone who loves both Japanese pop culture and kitties! They make perfect gift ideas for everyone from your manga-loving teen to your world-traveling best friend! The hardest part is deciding which one you like best! 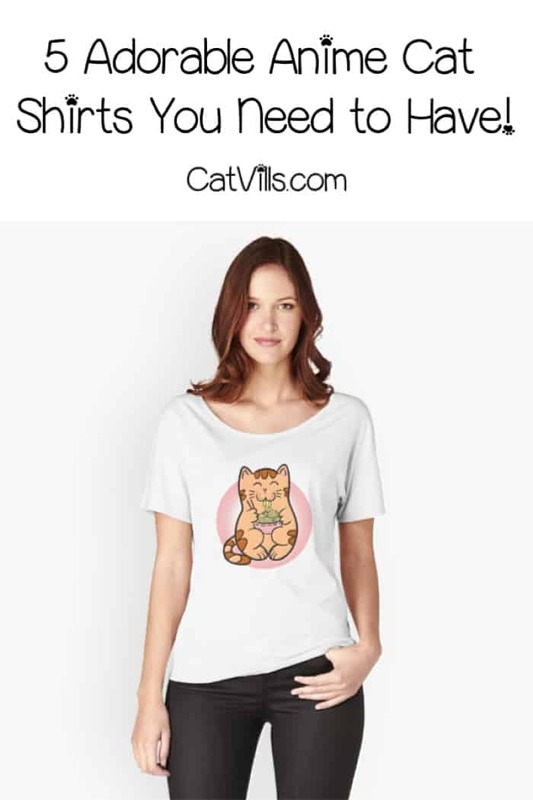 Don’t forget to check out cat lovers gift for more great ideas! This post contains affiliate links. If you make a purchase through these links, we earn a small commission at no extra charge to you. All of the shirts are available on Redbubble and on Amazon, unless otherwise noted. First up, this adorable anime kitty just kicking back and relaxing in his big orange bowl of yummy ramen! It comes in a myriad of colors both on Amazon and Redbubble! Fun fact: did you know that cats are considered good luck and good fortune in Japan? That’s why you’ll see them in so many windows throughout the country. If the orange bowl is a bit too bright for you, we have the darling kitty kicking back in a pale bowl. Hey, I get it, not everyone likes bright colors! 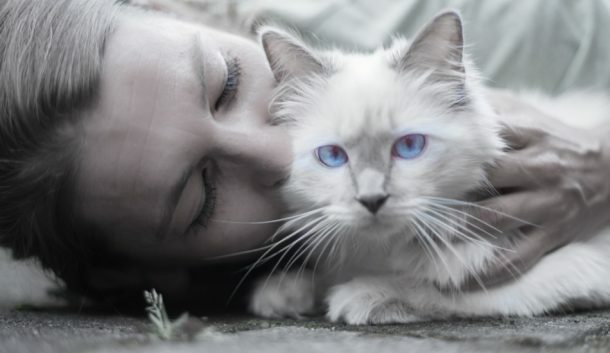 Fun Fact: Upper-class people started living with cats in Japan over 1,000 years ago! The middle and lower classes became cat parents a bit later, only a few hundred years ago. This kawaii kitty eating ramens out of a bright pink bowl is one of my top two favorites! I love the colors and the happy little face on the kitty, don’t you? Fun fact: Kawaii means “cute” in Japan, and it’s actually an entire movement! Hello Kitty is probably the most famous kawaii kitty. She was originally created in 1974, making her older than me! 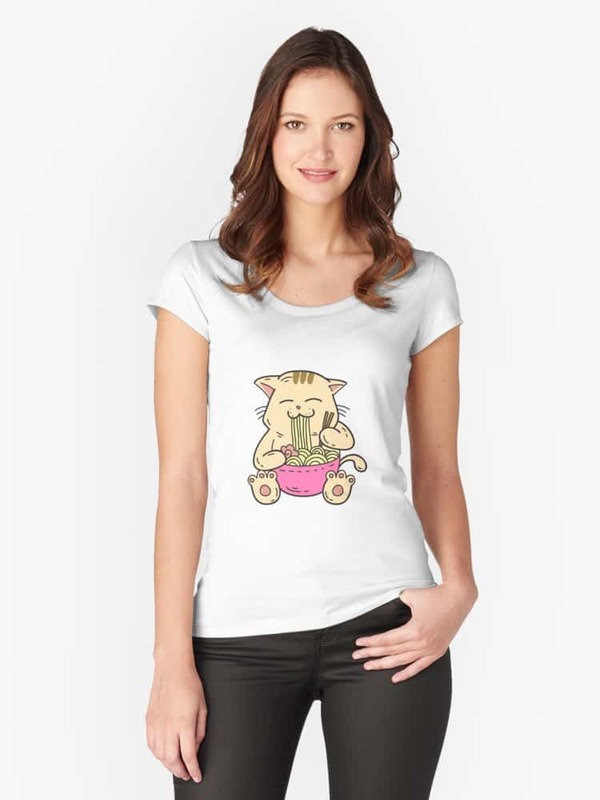 Like our pale version of the kitty in the bowl, this one is a more toned-down version of the above shirt. My son prefers this one because he’s not really into the bright pink. Fun Fact: There is an entire Cat Island in Japan! It’s called Tashirojima Island, and cats actually welcome boats as they pull into port. There’s even a shrine to cats on the island! Remember I said that the pink bowl cat was one of my top 2 favorite anime cat shirts? Well, here’s my #1 all-time favorite design! Related: Anime Cat and Dog Designs. Fun Fact: Cat Cafes are quite popular in Japan, especially for those who can’t have their own kitty at home. There are currently over 150 of them! All of these adorable anime cat shirts also come in hoodies, long sleeves, and even in dresses (over on Redbubble). You’ll also find them on PopSockets & home decor. Which of these anime cat shirts is your favorite? Share below! These are all super cute! The Vibrant Anime Kitty Relaxing with His Yummy Ramen is my favorite design! I did not know that cats were considered good luck in Japanese culture. I would definitely wear one of these tees! They are so cute! My cousin is big on anime AND cats (and ramen lol). She will love these. All of them are super cute! Teeturtle has a few cat ones also – and they’re super funny! These are really nice and a perfect Christmas present for all catlovers. This just gave me an idea on what to give my bestfriend his Christmas. Super love the last one. It’s the cutest. I like the cat eating ramen. I am sure it checks the boxes for quite a few people. These anime t-shirts are so cute. I think I will get a few of these for Christmas gifts to friends I know who love cats!